Have you jumped on the bandwagon yet? For chocolate avocado mousse that is. 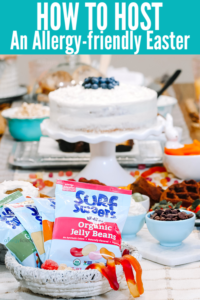 Before you start cringing up your nose or before you chime in with “my kid (or husband) will NOT eat that”, let me tell you why you will want to try this. First of all, there is no added sugar. Secondly, it is amazingly creamy, rich & decadent without all the calories. Third, this dessert has nutrients (bonus points for this). Fourth, it’s easy to make. Finally, although most important, Chocolate! So when you have a chocolate craving that you want to fix fast, but you don’t want to ruin your diet in the process or fill your kids with garbage treats, then this is a MUST MAKE. 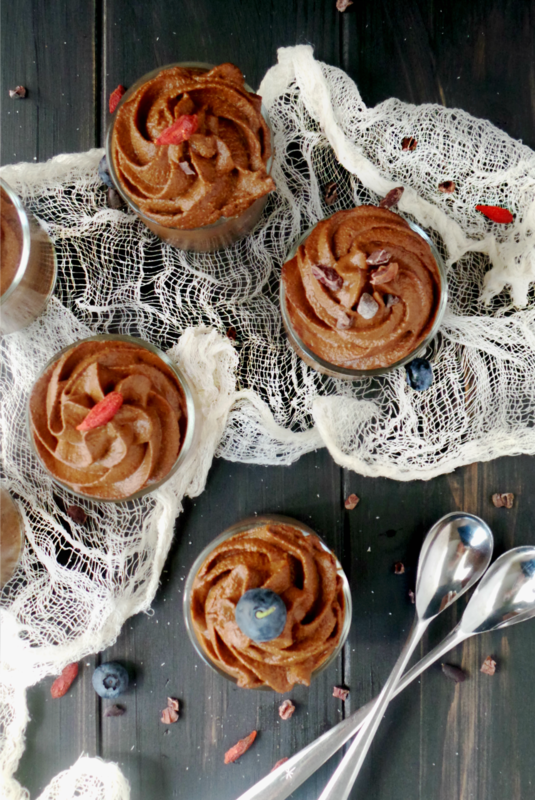 I’ve tried so many versions of chocolate avocado mousse and I cannot tell you how many versions I just could not stand! 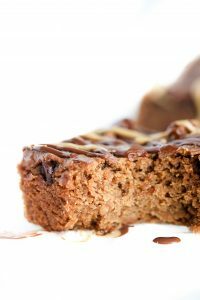 Most, in an effort to remove sugar, substitute Stevia and although it does have its place, that place is not in my belly. I am just NOT a fan and would rather go without sweetener, than use it. However, this recipe does need a little sweetening up, especially if I want to call it a dessert (and I want others to like it). That’s where the dates come in. They are naturally sweet, low glycemic, and contain fiber, potassium & magnesium which are all essential nutrients. Most dates you find, have been dried (like a raisin or prune) and can be eaten as a snack, but for this to work just right, I like to soak mine in a little warm water for about 10 minutes. This just allows them to blend more smoothly and all the sweetness seems to come right out. Avocado is where all the rich, creamy texture comes into play. Don’t worry,,,, it won’t taste like guacamole! This healthy fat actually takes on the flavor of whatever you pair it with, which in this case is chocolate! 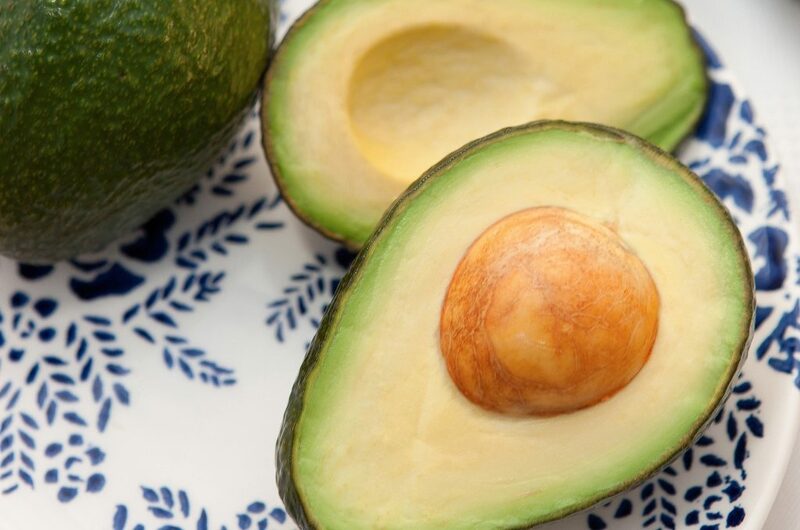 And in case you’ve ever wondered just how to pick the perfect avocado, here’s a little hint for you that has worked each time……find a fruit that is starting to soften (you don’t want mushy) and pop off the little stem from its top. If it’s still green underneath, then you are good. If it’s turning brown or black, then just put it down and find another. 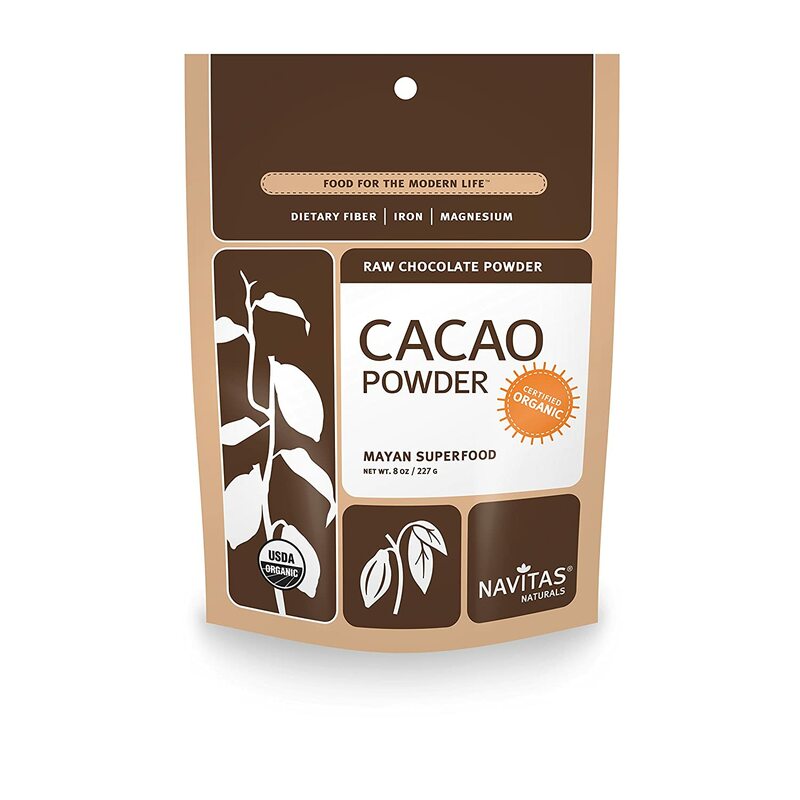 Cacao is a raw chocolate powder that I like to use in place of unsweetened cocoa. Cacao is the purest form of chocolate, under processed and raw, therefore holding on to its many superfood powers. Cocoa is another option, if you cannot find the other. Cocoa is basically what happens when you heat the cacao seeds and process them. Although not raw, it does still contain antioxidants, as long as you purchase the unsweetened kind, and therefore can be used interchangeably if need be. Now that you have all the basics, let’s grab your avocados, cacao powder, Medjool dates and let’s get this party started! Avocado & Chocolate pair together wonderfully and there are so many things you can do with it. Blend together for a creamy smoothie like Texanerin’s Chocolate Avocado Smoothie or mix together to create some drool-worthy brownies such as Dishing Delish’s gluten-free Avocado Brownies & Wholesome Yum’s Chocolate Avocado Brownies. Just be sure to make adjustments to remove other allergens if need be. 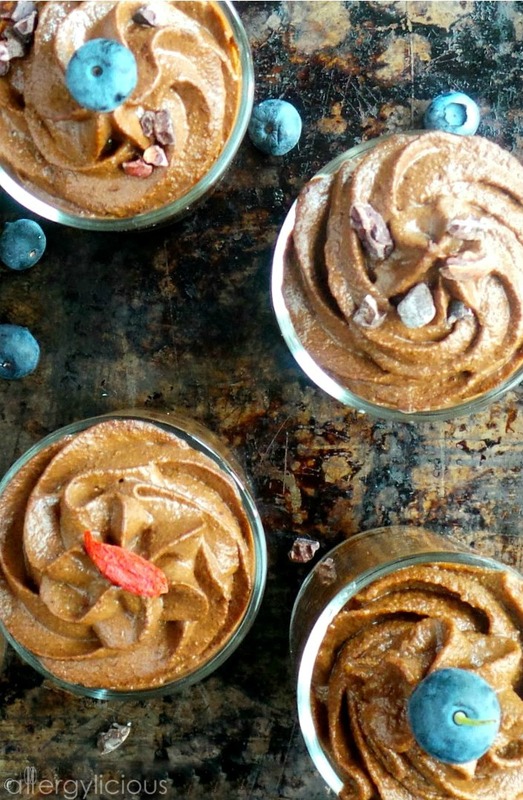 Rich & creamy, Chocolate Mousse, made from creamy Avocados, Cacao powder & Medjool Dates. This healthy recipe not only tastes amazing, but is good for you! Vegan, Gluten Free & Paleo. Allergy-friendly. Combine all ingredients in a food processor except for cacao nibs. Process until smooth, adding additional milk if needed. Pipe into serving dishes for a fancier presentation. 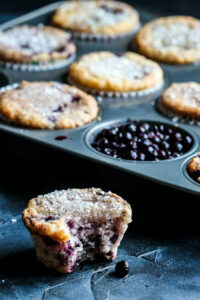 Garnish with fresh berries or coconut flakes if desired. Yummmmm! Isn’t it great to know that you can indulge a little and still be eating healthy?! I must admit I’ve been lacking in my avocado consumption! This will remedy that! And sometimes you just have to change it up a bit! Thanks Uma. We made this alot during our Daniel Fast when friends were all craving sweets. It seemed to get them over the edge. I adore chocolate avocado mousse. It’s amazing what you can do with that fruit. Yours look delicious. i made avocado chocolate pudding long time ago and did not like it…i need to give mousse a chance as your photos are soooo freaking gorgeous! I’ve made a few in the past as well that were not ones to rave about but this one was our winner and everyone liked it. I’d love to hear if you make it and what you think. Looks so so good!!! Super creamy and super dreamy! Love the pics! Chocolate avo pudding is a staple over here!! Such a great way to get extra protein and veggies in. This looks delicious! And the kids love it, so its a win all around. Wow, that mousse looks so tempting! The delicious things we can make with healthy ingredients are just amazing. 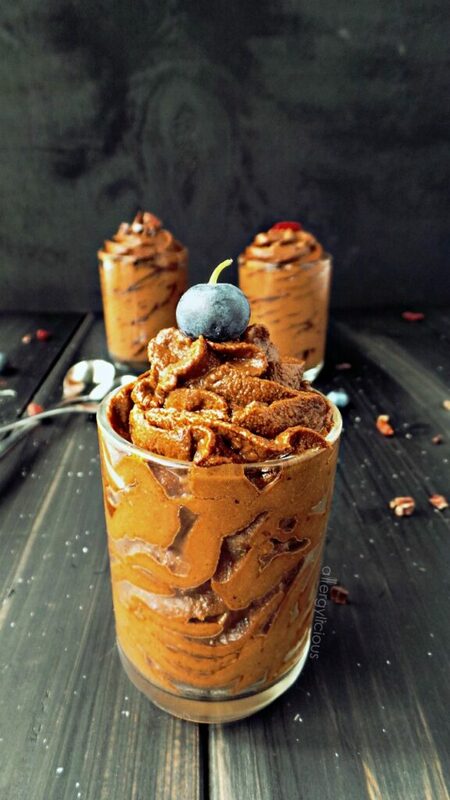 I just love chocolate avocado mousse!! 🙂 I actually just posted a recipe for avocado gingerbread chocolate mousse around Christmas. Oh yum, that sounds awesome too. What a fun way to change it up for the holidays. This looks so luscious and amazing!! Love that it’s sweetened with dates too! Thank you Leah. I wanted to stay away from sugar cane, and the dates sweetened it up just perfectly. I have yet to jump on the chocolate avocado mousse bandwagon but yours looks great. I have everything needed so might well give it a try later. Oh, I can’t wait for you to try it. Minus the dates (because I can’t do fruit) I AM ALL FOR THIS! Gigi, no fruit at all? There are a number of foods we cant include in our diet either, although fruit is not one of them. Its weird how at first you think “I can’t do that” and then it just becomes second nature.